Since we have a little one who will be bipedal any day now yeesh, Jen’s been after me to put up a baby gate at the top of the stairs. 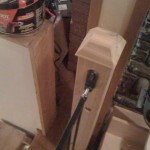 The instructions said it needs to be installed into a solid if not structural elements, which presented a problem. 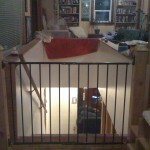 The staircase has sidewalls, but they have about three 2×4 studs each — you can wiggle them about an inch either way without even needing any effort — so I couldn’t install the gate into the obvious opening. There are structural columns at the top of the stairs which are in place of the original outer wall of the gable cottage but which now form one of two arches from the addition on either side of the fireplace — one into the stairwell and the other into the living room. But they’re too far apart for the gate. So I built extensions, I guess you could call them, that anchor into the columns and make the opening narrow enough for the gate to fit. They’re not particularly pretty (I learn a lesson about carpentry every time I pick up a power tool: in this case, don’t try to drill a perfectly perpendicular hole without one of those mini-drill presses you attach to your drill), but at least instead of having bare ends of 4×4 posts sticking up I covered them with little fence post caps. So it’s nice to have one project completely done with and checked off the list. I got the floor down a couple of weeks ago, but it’s just been sitting there mocking me ever since. 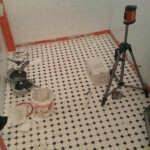 As you can see in the photos, it’s an octagon-and-dot mosaic tile, and I really should have used a smaller-notch trowel. Pretty much every joint has thinset squidged up into it. That is to say, every one of the thousands and thousands of little tiny joints has thinset squidged up into it, some halfway, some to the top. Scraping them out with a utility knife is going to take forever. I’ve been working slowly on finishing the drywall — it’s not that it’s particularly difficult, it’s just the first time I’ve done it so I’m figuring out my technique as I go along. But the bathroom absolutely must without fail be all the way done by Thanksgiving, so I took the day off work today to get as much done as possible. I spent the morning doing second-coat on the drywall, and then Jen called and said she was taking a half day and would be home to help. So we decided to attack the walls. I mixed up a bunch of thinset, set up the borrowed laser level along the reference lines I’d already marked, and then Jen went to town setting all the field tile while I worked on making all the odd cuts and fits. The result: we have walls! 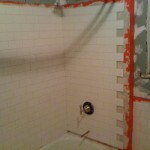 There are two reasons we didn’t completely finish: I can’t do the ends of the shower walls because the end-bullnose tiles are on order, and I can’t do the top row of tiles until I’ve skim-coated the drywall (since there will be a bit of overlap). The bottom row of black tiles is just going to be an evening of cutting and fitting, and we were both tired after working all day, so that’ll have to be another post for another day. And here’s why my wife is awesome: not only did she do almost all of the work to get the tile up, she actually got it up a lot faster than I would have done. If she hadn’t taken a half day off, I’d probably have gotten one wall done and maybe two, instead of all of them. And that doesn’t even mention all the work on the rest of the house she’s been doing while I’ve been putting all my energy into one room. The fact that this place looks like a home instead of a box and tool storage facility is all due to her. 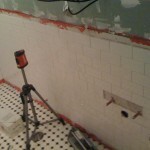 Now I have to figure out the best way to interface between the 1-1/2″ ABS and the 1-1/4″ standard sink drain and P-trap. I guess the trap escutcheon is going to have to cover a lot. Oh, and here’s a photo I forgot to put up months ago. 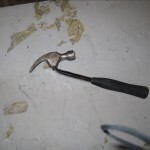 Moral: don’t try to pull eighty-year-old framing nails out of eighty-year-old wood with a little bitty finishing hammer. 1. 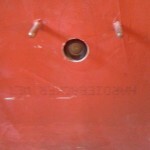 If you’re using HardieBacker cement board, don’t use generic cement board screws. Make sure to buy the green-coated square-drive HardieBacker brand screws. With the 80-year-old framing in our house, driving one of the generic screws went like grr umph argh oh hell that’s good enough whew that’s one; whereas driving the HardieBacker screws went like zip ZARCH zip ZARCH zip ZARCH. 2. 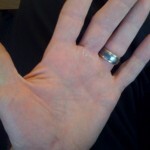 Don’t mix thinset with your bare hands, no matter how expedient it seems to be at the time. Last night I was cementing down the backer board sheets to the bathroom floor, and at first I mixed up what I thought was half the 50-pound bag but only turned out to be about a third of it. That was easy — the drill + mixing paddle seemed to be able to handle it, and hand mixing with a brick trowel wasn’t too hard. But it only put down one and a half sheets. So I went to mix up the rest and it didn’t want to mix — I put down my drill when I noticed literal smoke coming out of the motor housing, and still there were huge dry clumps at the bottom that the brick trowel wasn’t breaking up. So I just stuck both hands in and kneaded it like the world’s thickest cookie dough, and then washed my hands off under the hose immediately afterwards. 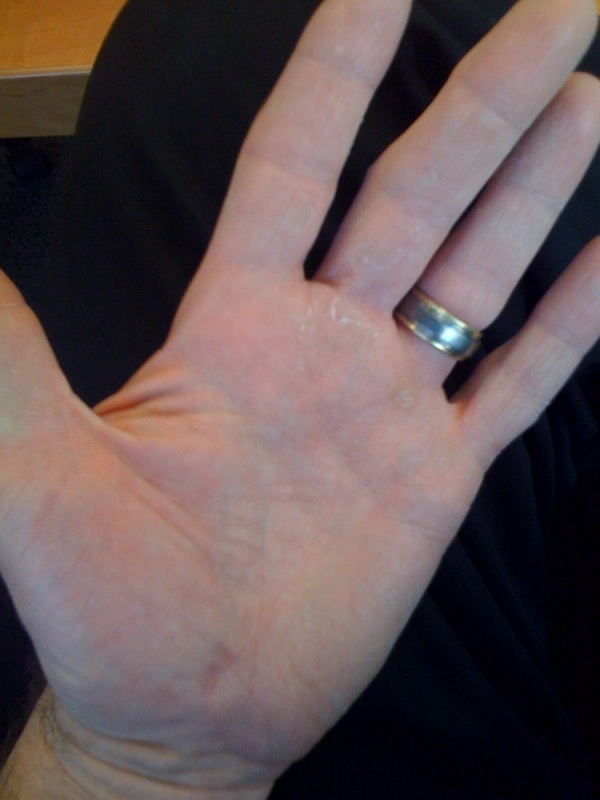 About two hours later, as I was thinsetting the joints, I noticed that my hands felt sticky, like there was a thin layer of rubber or silicone on them. When I finished all the jointing and cleanup at 12:45am, I realized that, no, in fact, it was the skin on my hands that was peeling. I guess this is my first remodeling “injury” — so far hardware stores have been more dangerous than the actual work, as I bash into wire racks sticking out into the aisle and so forth.